1. The welcome sign as you approach the village. 2. Like Malvern England there is a fountain, in this instance commemorating war dead. 3. The train station with a train just about to cross the main street. 4. Shops in the village. 5. The high profile Police Headquarters. 6. View down the main street. 7. Malvern shops and the post office. 8. Meeting the mayor and exchanging gifts from one Malvern to another. From right to left: Jill Valli, Deputy Clerk; Anthony Marino, Trustee; Mayor Patricia McDonald; Dr. Bruce Osborne and Cora Weaver, envoys from Malvern England;Teresa Emmel, Village Clerk/Administrator. 9. The local cinema and diner. 11. Typical house decorated for Halloween. 12. Your invitation to return as you leave Malverne. Malverne, Long Island, New York State has a history that is detailed in a book published in 1972. Titled 'Malverne, The Story of Its Years', it was written by G J Janeske. From this we can build an appreciation of how Malverne NY came about. Alfred H Wagg built homes as part of the initial development of the locality in the early 20thcentury with Ernest Childs securing one of the new constructions. Both men were management employees of the Eimer and Amend Chemical Company of New York which was behind the development initiative. It was these two men who were influential in the naming of Malverne in 1913. Several names were proposed after there were allegedly problems with the failed delivery of a pump for Childs, it having gone astray upstate. Childs had visited Malvern, England and was so impressed that the name was agreed for the emerging village. 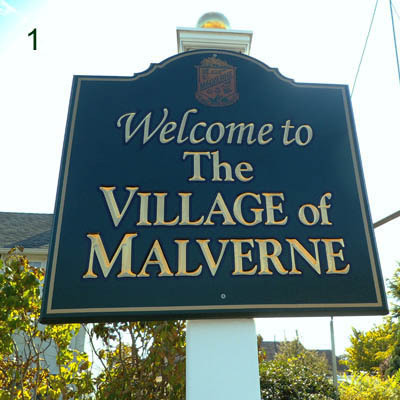 The e on the end was supposedly a mistake by the railroad company who misread Child's handwriting but another explanation is that Malverne NY just wanted to be slightly different. Nevertheless the name has stuck and has led to it being celebrated as one of two dozen Malverns around the world. 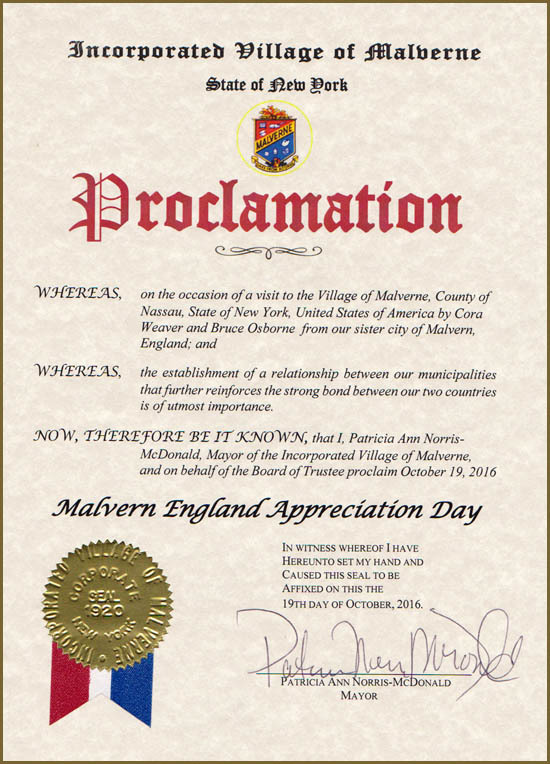 Below - the mayor's Proclamation from Malverne NY (Mayor McDonald) to the mayor in Malvern England (Mayor Cllr Palmer). 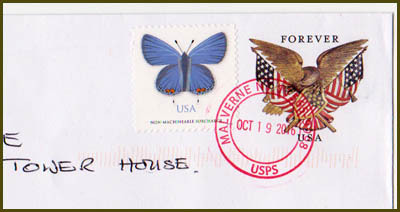 Above - postmark on mail sent from Malvern NY to the United Kingdom on October 19th, Malvern England Appreciation Day 2016. Picture left: Following the return of the envoys back to Malvern England from Malverne New York, the presentation took place in Malvern England of the reciprocal proclamation. This was done by Cora Weaver to Mayor Cynthia Palmer in November 2016. 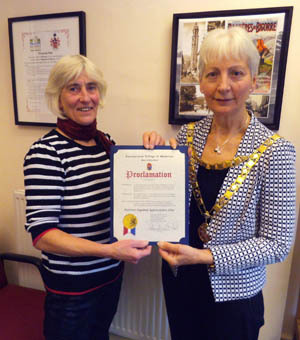 In her letter to Malverne NY delivered by the envoys, Cllr Palmer had referred to the last correspondence between the two mayors, which was from the mayor of Malverne in 1953, congratulating Malvern England on the coronation of Queen Elizabeth. Cllr Palmer also drew comparisons between the two Malvern(e)s, describing them as green and pleasant and safe to live in.